Now you can work on all of your graphics on one page. When your ready, open up GDG Save Em an quickly save each item to it's own file, or each page, or each item on every page. Wait, you just want to save the shapes but not the text, and only the red shapes you say. No problem. With the many filters options you can save just the shapes with a red fill if you choose. Or exclude the rectangle borders. No problem, the filters have you covered. Many other options include saving as a specific CorelDraw version, saving each page as a file, only selected items as files...you get the idea. You can use this instead of the default CorelDraw save dialog and save your file, your way, quickly and easily, just how you want to! NEW: Now the macro can save not only as CDR but EPS, and AI files as well, and at the same time. 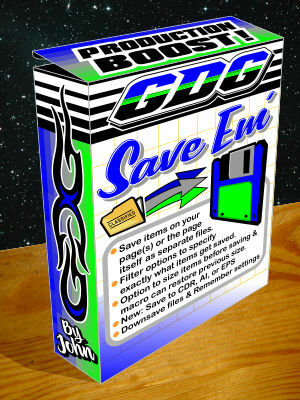 For other formats: save as CDR then use the CorelDraw built-in file converter on the generated files. This is the v.2019 version.